The finished quilt is 35 inches by 42 inches. Techniques: I used machine piecing and applique. This quilt is home machine quilted. It was made and quilted by me (Polly Carlson.) The best category is: Baby Quilt, Applique, Quilt Photographer. This is entry number 21. This was so much fun to make, I thought I'd go ahead and enter it in the Blogger's Quilt Festival at Amy's Creative Side. It's just the right size for him to play on or tuck around him in the stroller or crib. If you're interested in making your own, I have the full tutorial here. But basically, I used squares and appliqued the knobbies onto them. 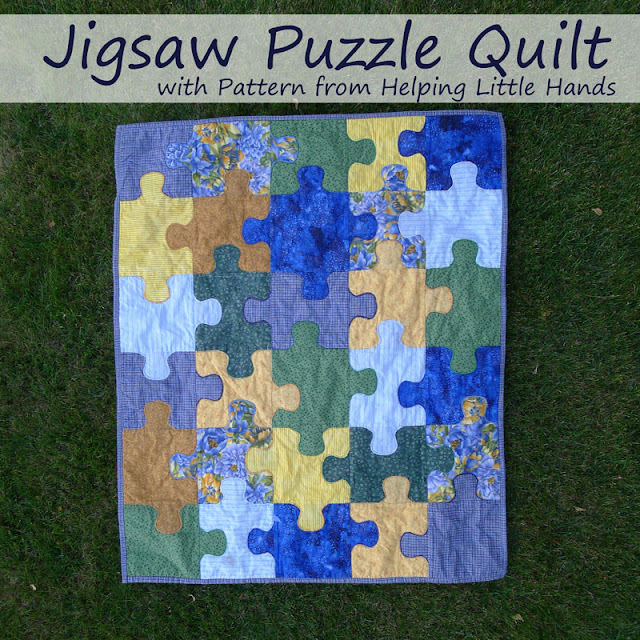 It made for a fast and fun quilt that looks more like an actual puzzle then most puzzle quilts I've seen. I used basting spray to prepare it and then machine quilted it on my regular sewing machine. I really like your clever idea to make a quilt that looks more like a real puzzle than any other puzzle quilts I have seen so far. 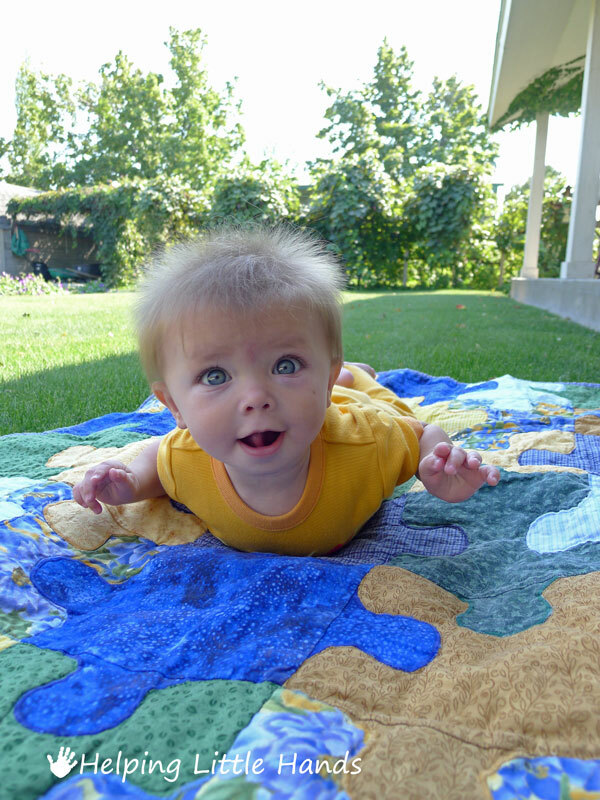 Your baby is just too cute! Love this quilt - thanks for the tutorial. Looks great! 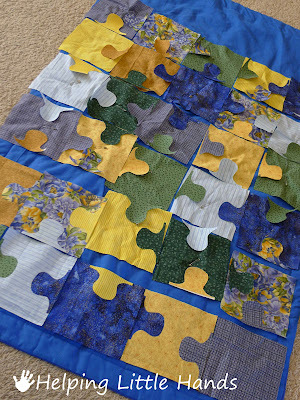 And it does look so much more puzzle than most puzzle quilts. Using applique was genius! And can I tell you how much I'm loving the karotype onsie! too fun. Such a great quilt. Very beautiful! I love the puzzle look, and what a great way to put it together. Bravo! Wow what an amazing quilt!! Great job. I can't keep from smiling - your little man's hair is the best baby hair I've ever seen! 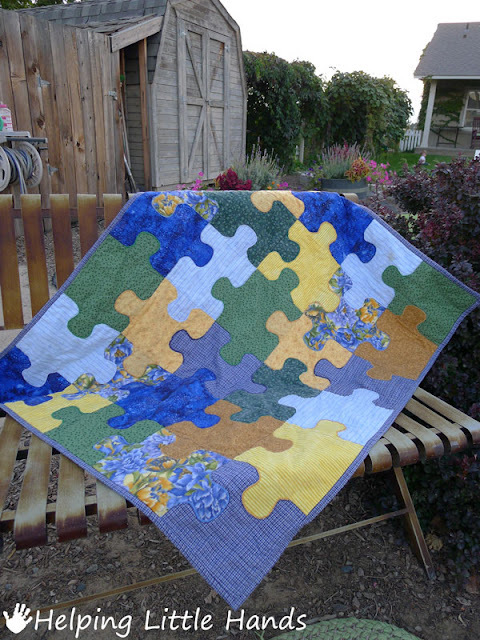 I love your quilt design - such a great idea to applique the knobby parts. Most other puzzle quilts look too squared off. You did a great job. 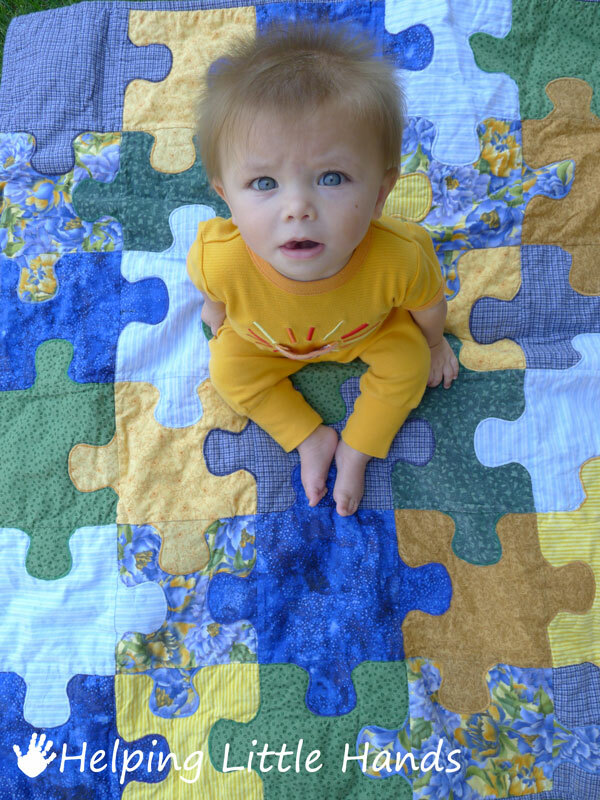 This is such a great quilt and he is such a cutie pie! You come up with the most fun science outfits for him. Thanks for sharing your secret, I was loving it but thought I could never make it as first LOL! And I sure wish I had such a cute quilt model! The quilt is super cute. But Anson really stole my heart. Those big blue eyes and that hair! I've been looking for a jigsaw type quilt for ages and this is beautiful. I think I'll be visiting your tutorial! Gorgeous! Super job.....the quilt is so cute. And great photos too! What fun and happy baby! That is one cute quilt, especially with the joyful model! fun quilt. cute colors, love the model. This is so lovely and what an adorable little boy Anson is! Thanks for sharing. You did a lot of puzzling there but it's gorgeous. Decisions decision... What is cuter, the quilt or the baby??? :-) Thanks for sharing the tutorial, I do remember seeing it before, but this time I have saved it! I love puzzles so this is a must! Your quilt is adorable. I have never seen one like that! Beautiful! 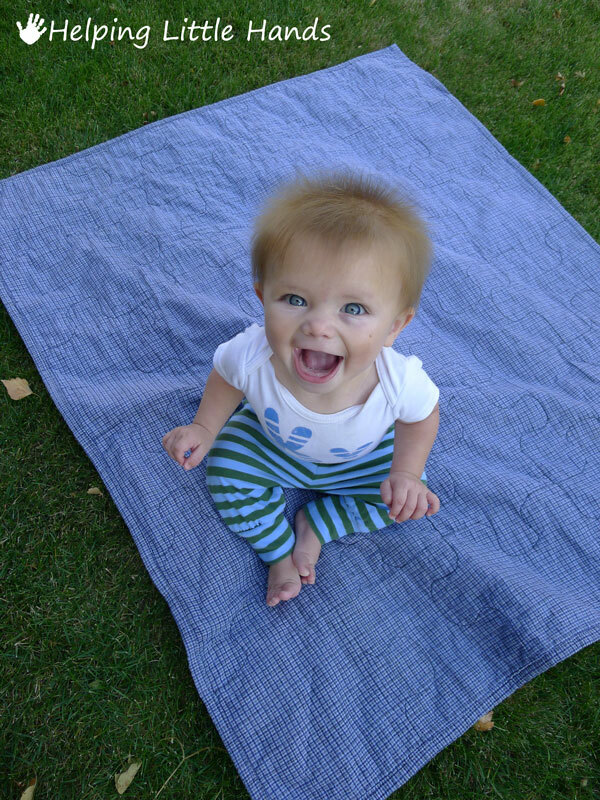 Gorgeous quilt and gorgeous baby. What more could you ask for? The quilt is so cute and fun. I could look at those adorable baby pictures all day, he is so cute. Thanks. You get the cute kid on a quilt award! Thanks for the tutorial. My mom is a jigsaw nut, and she would love this. I like that idea of real puzzle look. Turned out great! The quilt is great, but your helper/model is so adorable - Good job. honestly can't decide if I love the quilt or your model more! =) Great job! Love this. I think I saw this at the Quilting Gallery too? 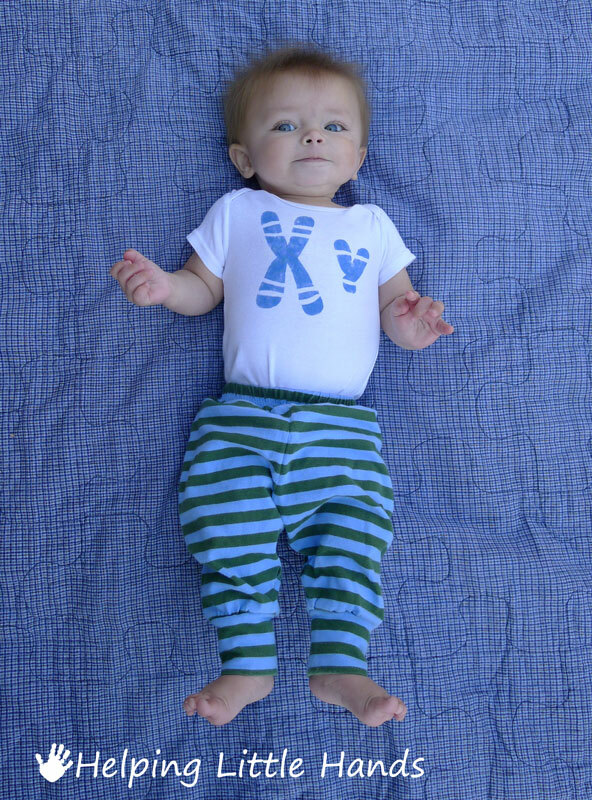 Your model better watch out....he might get too many kisses he is so cute! That's a neat concept and quilt. What a fun quilt. I love the concept and the way you constructed it...and of course, you have the cutest little guy ever!! Cuteness doubled! 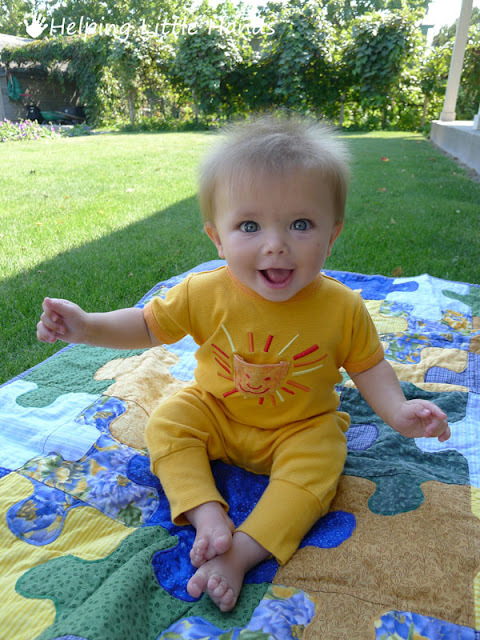 Great quilt and such a bright-eyed little guy - precious!